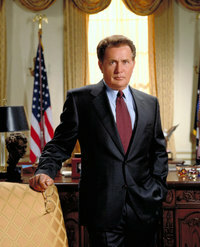 As previously reported here (and now just about everywhere), NBC will air the last original episode of The West Wing on Sunday, May 14th, 2006. The series has been on the air for seven seasons and, at one time, was a big winner in the Nielson ratings, with critics and with Emmy voters. Hard to believe that originally NBC didn’t really care for the show. Flash forward seven years later and history repeats itself. When NBC first announced that it was canceling the former ratings-powerhouse drama, it was said that the final episode would be accompanied by a one-hour retrospective. Now, just days before the finale, apparently, something has changed. Reportedly NBC couldn’t come to financial terms with the cast (Martin Sheen, Allison Janney, Richard Schiff, Bradley Whitford, etc.) on whether they would be paid (or how much they’d be paid) to appear together and reminisce about the show. In contrast, re-airing the Emmy-winning pilot costs NBC very little because its production costs were paid many years ago. Though some consider the last season of The West Wing to have been a strong one creatively, the numbers have not come close to the ratings the show experienced in its glory days. 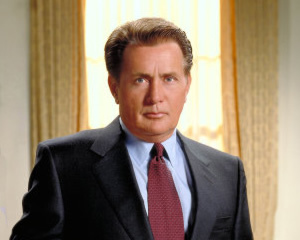 And as such, in true political fashion, it seems that the network is treating the show and the Bartlet administration like a lame-duck presidency. It was a pleasure working with Jimmy Smitt as one of the Secret Service Santos detail. Jimmy is cool calm.